BY mistake i have given form no 15-H to the bank against my FDA interest for the year 2018-19, but on other investments in SCSS , parked money with private parties i have not given 15H for the same FY 2018-19 . Any complication can be anticipated for giving 15H for the bank. Please write to Nodal officer in ICICI Bank. If they do not act you can contact ICICI ombudsperson. What is the best way to save money monthly for a period less than 6 months? You can read my post – Where to Park Money for Very Short Term [less than 6 Months]? Hi, once we open the RD with the bank, is the interest rate of the RD is same throughout the tenure? Or will it change during tenure whenever the bank changes RD rates? Thr advantage of RD is you lock the interest which is offered at the time of account opening. The interest rate remains same through the tenure of the RD. 15 G or 15 H is submit in every quarter on ones in year ? Form 15G/H has to be submitted once every financial year. You should ideally do it at the start of the FY (i.e. in April) or when you start investment. If RD is more than or equal to 5 years, is it still taxable interest? For long term deposits above 5 y, it wont be TAX I think so. Any update on this please. All RDs are taxable irrespective of the duration of investment. You can read more about Tax on RD & FD here. For 4-5 years period equity mutual funds would be risky bet. If you are in lower tax bracket I would recommend Recurring deposit and in case of higher tax bracket go for SIP in debt/debt dominant mutual fund. Is the interest rate on RD for vijaya bank compunded quaterly? 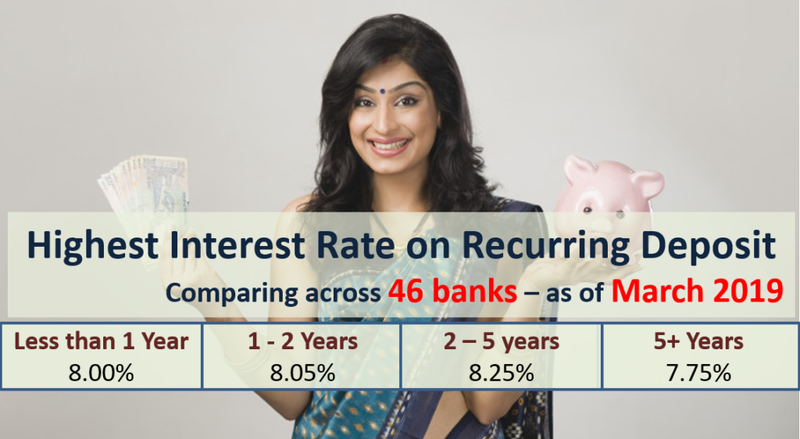 In April recurring deposit interest rate will reduce? There are high chances that interest rates might come down going forward. It would happen in next few days or next few months is difficult to predict. But Post Office RD is for sure going to come down in April. I wanted to invest 10000 per month towards RD and since I have a HDFC salary account, I thought of opening one RD accont in HDFC itself. Now when I used the HDFC RD calculator, it shows 7.90% interest for 12 months, but after amount after maturity is only 125,262 when it should be 127,900. Any reason why it is 125,262? The interest is compounded quarterly for most banks so the maturity amount shown by HDFC is correct. I think you took interest as monthly compounding. 2) Will it consider RD being invested in three years and deduct only for 22562 (52562-30000)? The bank would deduct TDS every year if the total interest received on all your deposits (except saving account) across the bank branch is more than Rs 10,000. So if the total interest for FY 2015-16 is Rs 11,000 – the TDS would be Rs 1,100.